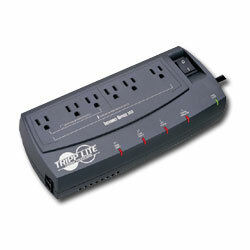 Tripp Lite's 150 Watt Internet Office Standby UPS System with Modem/Fax Protection provides complete power protection for your entire computer set-up. 300 VA power capacity maintains your Internet connection allowing you to work online through short blackouts or safely shut down during longer ones. Convenient Undermonitor design with individual front panel switches provide greater control over connected equipment. Unique design features 6 outlets and diagnostic LEDs. Built-in RJ45 jacks prevent surges from damaging your modem/fax/10BT equipment.